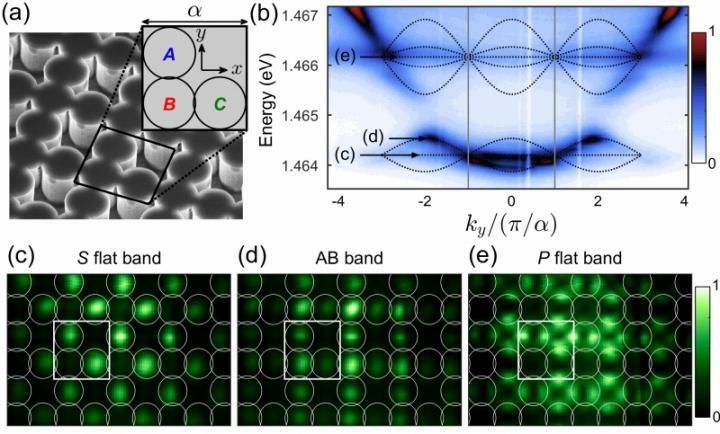 An international research team produced an analog of a solid-body crystal lattice from hybrid photon-electron quasiparticles – polaritons. In the resulting polariton lattice, certain particles' energy does not depend on their speed. At the same time, the lattice's geometry, particle concentration and polarization properties can still be modified. This opens up new perspectives for study of quantum effects and the use of optical computing. Results of the study were published in Physical Review Letters. A solid body is formed around a crystal lattice formed by atomic nuclei. Lattice geometry may influence the relation between a particle's energy and velocity. Lattices are divided into several kinds according to their geometrical properties,. Some of them, such as the Lieb lattice, have so-called flat bands: a state of particles when they show no energy-velocity relation at all. From a formal standpoint, particles in flat bands have infinite effective mass. Flat bands are of great interest for fundamental science. They are used to study superconductors, ferromagnets and other quantum phases in electrons. However, quantum phases can also be observed in light elementary particles – photons. This requires creating an artificial photonic analog of a solid body: a so-called photonic crystal with adjustable geometry. Such conditions enable scientists to observe and manage various quantum properties of particles much easier. Physicists from ITMO University and University of Sheffield have created a photonic analogue of a Lieb lattice and confirmed that quantum effects in a photonic structure are indeed stronger. "Strictly speaking, we were dealing with polaritons rather than photons", explains Dmitry Kryzhanovsky, Senior Researcher at ITMO University and professor at the University of Sheffield. "This hybrid condition occurs when excited electrons mix with photons. Such hybrid particles interact with each other, much like electrons do in a solid body. We used polaritons to create a crystal lattice and studied their new properties. Now we know how polaritons condense in flat bands, how their interaction breaks the radiation symmetry and how their spin or polarization properties change." Since polaritons maintain their spin rotation continuously, scientists are now able to observe polarization for a long time. Furthermore, easy control over polariton concentration in the lattice provides more options for precise management of the system. "From a fundamental viewpoint, polariton crystals are interesting in that they provide a great variety of quantum phases and effects that we cannot study in standard crystals", says Ivan Shelykh, head of the International Laboratory of Photoprocesses in Mesoscopic Systems at ITMO University. "Polarization can serve as an information storage element. All calculations are based on a binary system. There must be 0 and 1, so to implement optical computing we need two corresponding states. Polarization, right and left, with a number of intermediate combinations, is an ideal candidate for quantum-level information processing." A great contribution to the creation and study of the polariton crystal lattices was made by staff of the University of Sheffield. Professor Maurice Skolnick from Sheffield heads a megagrant project on hybrid states of light together with Ivan Shelykh. "All the experiments were carried out in Sheffield, while theoretical modeling and analysis of the results were done at ITMO University", says Shelykh. "I consider this work a good example of what science should look like. Results of an experiment are incomprehensible when published without any interpretation. Similarly, raw theory using unrealistic parameters is difficult to apply in practice. But here we combined theory with experiment – and we plan to keep doing it this way. Our next goal is to obtain and investigate the topological boundary conditions of such a lattice".